How to Book Retiring Room Online on Simple Steps? What is Retiring Room in Indian Railways? Retiring rooms are rooms provided by Indian Railways to their passengers across India with different variants like Single, Double and Dormitory type of occupancy with AC and Non AC combination. What is the Duration of Retiring Rooms Booking Online? Duration of booking is said as Minimum 12 Hours to Maximum limit of 48 Hours. Is there any restriction for the room accommodation combination? For one passenger, one Single Bed Room or One Double Bed Room or One Bed in Dormitory can be can be allocated. For two passengers, One Double Bed Room or Two Bed in Dormitory can be allocated. For three passengers, (one Double Bed Room + One Single Bed Room) or Three Bed in Dormitory can be allocated. For four passengers, Two Double Bed Rooms or Four bed in Dormitory can be allocated. For five passengers, Two Double Bed Rooms or Five bed in Dormitory can be allocated. For Six passengers, Two Double Bed Rooms or Six bed in Dormitory can be allocated. 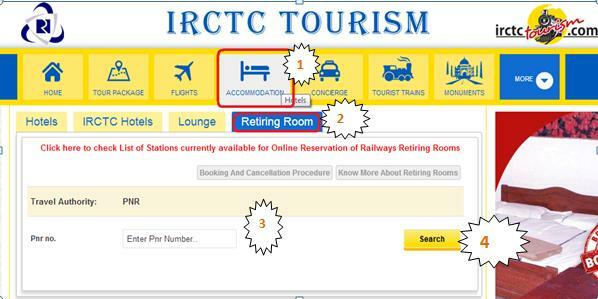 Step 1 : as usual first process to start this activity is to open the IRCTC Tourism website. To open IRCTC Tourism you just have to type http://www.irctctourism.com/ (You can open the website by open the Internet Explorer or Google Chrome or Mozilla Fire Fox etc and type irctctourism Website). Remember this is the only website allowed to provide the the Retiring room booking online. Step 2 : After open the IRCTC Tourism website click on to the Accommodation tab specified like picture. After that select the Retiring Room option. Step 3 : Once you have selected the Retiring room option enter the PNR (Passenger Name Record) Number. This number available on your IRCTC booked ticket or Counter booked ticket top side. After entering the PNR Number click search button to get the result. Step 4: Next page is depend upon your decision to book your retiring room on Source station ( Starting station) and Destination (Ending) Station. If you want to book the Retiring room for Source then click that and if you want to book the Destination station click on to the Destination button. Step 5: Now you have to choose the Check in Date , Check Out Date , Bed Type and A/C etc. Step 6: After that check availability by click check availability button. Step 7: Will show the occupancy availability with details. After that Select the Room no and Slot Duration that you would like to book. Click on “Proceed” to continue. Step 8 : It will redirect you to login page, login with your user name & password registered with IRCTC. If you are not registered user choose “Guest login”. After that You will get the complete booking details. Step 9 : For each passenger select “Room no” in which he/she would like to accommodate. Then select the Id card type and card No. Click on Proceed button to continue. Step 10 : It will show complete booking details. Click on “Make Payment” for payment. Select your desired payment method just like IRCTC online ticket booking.